​of Adventure With Us This Season! complete with the best meals in the NH whitewater rafting industry! With a high safety (and fun) rating as one of the oldest raft company in the state, our adventures are sure to impress and be the best whitewater experience on the Androscoggin River. And we are just 8 minutes away from the put-in point on the Androscoggin River, and 5 minutes from the take out! After a rafting adventure, return to our Barn for our barbecue. Our meals always include your choice of sirloin steak, Atlantic salmon, grilled marinated chicken, homemade sides, and chocolate chip cookies. Relax, enjoy the views of the Mahoosuc Range and horses grazing in the pasture, while sharing the day's adventure with other rafters, too. Add on lodging for an awesome getaway! Join us this season for the best experience on the Androscoggin River, then come back for fall and winter activities! We offer trips to meet all ability levels, as well as providing canoe, kayak and tube rentals, shuttles, meals, and more! Groups of 10 or more receive a discount, plus passes to the Mount Washington Auto Road! Click a trip option below to find out more! Our most popular trip! Appropriate for all ages. 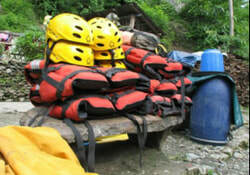 Great introduction to white water rafting for the whole family! Enjoy a morning or afternoon adventures! Available Fri, Sat & Sun only! We are located directly on Corridor 19 for snowmobile trail access! Trailer your toys up for a week of fun in the snow, lodging AND meals included! Also includes use of our hot tub, skiing trails, and winter wonderland fun! Check out our year-round lodging! ​Looking for a place to call your home away from home? We can provide you with comfortable lodging and the perfect base for all your North Woods experiences! Looking to paddle on your own? We also do canoe, kayak and gear rentals, plus can provide shuttle service to put-in points. *Schedule and availability permitting. ​View the Mahoosuc Range from horseback! Reservations are required for stall rentals. Enjoy 8 kilometers of forested trails on site. Dressage ring, stalls with 12x12 rubber mats, wash room, hay and water included. Bring your equine friends along! Great views of the Mahoosuc Range. ​Looking for a fun, relaxing day on the river? This is the trip for you. We take care of the details...you sit back and enjoy nature's playground! We also Offer DIRECT snowmobile access, Inn Lodging, Nordic ski Trails, Boat Rentals, Shuttle Service and more! Click here to check out Mahoosuc Outdoors!